When you click on the 'ADD TO CART' button, a new window/tab will open with the paypal screen summarising your order as well as any options you may have selected (see screenshot below). On this screen, you will be able to adjust the quantities of items ordered. Once you have read this screen, click on the 'Continue Shopping' link to close the window/tab and return to Zane's Magic Shop. Although we use paypal for our secure payment system, you do not need to register with them. Simply type in your delivery address and card details to complete the order. However, if you do have a Paypal account already, you can use this to pay within a few clicks. 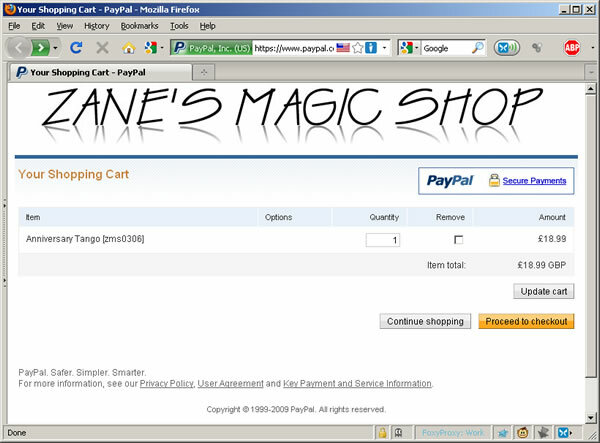 Click on the view cart icon at any time to view a summary of all tricks you have added to your shopping basket. There is also a 'view cart' link in the menu bar at the top of every page in this site. Note: All payments and personal banking details are handled entirely by Paypal which is highly secure and uses 128bit encryption to protect your information. We do not save any personal details on our web server. If you are still uncertain about using this payment system, feel free to call and we can explain how it works, alternatively, we accept cheque's and postal orders.